Anyone who has strolled through Rideau Centre recently can attest to the fact that it is deep into the process of a major face-lift. Rideau Centre General Manager Cindy VanBuskirk recently spoke about the $360 million renovation and expansion project and the changes we can expect in the near future. Rideau Centre is one of Canada’s top performing shopping centres and Ottawa’s busiest, attracting more than 21 million visitors annually. The Centre provides links to transit from the bustling Mackenzie King Bridge and Rideau Street and connects downtown Ottawa to the ByWard Market as well as the Shaw Centre and Westin Hotel. The redevelopment will add two direct access points to LRT’s Rideau Station which is set to open in May 2018. Those who have visited Rideau Centre in the past 6 months will have noticed the new quartz flooring, glass railings and the new Dining Hall which provides a unique, environmentally responsible “on the go” dining experience. The property is also undergoing a significant re-cladding of its exterior. A complete renovation of the East Bridge connecting Rideau Centre to the Bay across Rideau Street will start shortly. The plan also includes the demolition and removal of the West Bridge. Another intriguing feature of the redevelopment is in conjunction with the City’s proposed Public Realm Plan – a pedestrian mall on Nicholas Street between Rideau Street and Besserer Street. This unique public space will link the Ottawa University/Arts Court precinct to Rideau Street and the ByWard Market. Average household income in Ottawa is approximately 16% higher than the Canadian average and the Rideau Centre sits in the middle of a trade area with a population of over 1.1 million people. These desirable economic conditions are attracting new retailers to Rideau Centre. 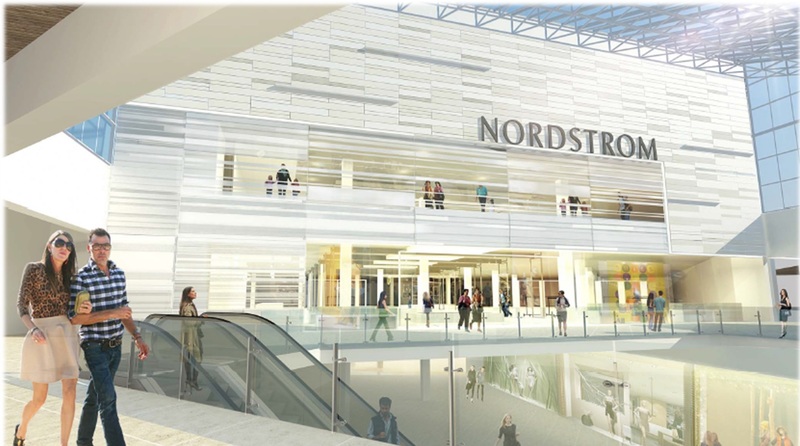 Recent first-to-market retailers at the property include J Crew, Kiehls and the soon to be opened Nordstrom, providing a blend of high-end fashion, aspirational luxury and edgy, urban style. Tiffany & Co., Kate Spade and Stuart Weitzman will join the mix in 2015 and Simons will open in the expansion in 2016. Rideau Centre will continue to cater to Ottawa’s fashion-savvy consumers by delivering best-in-class retailers at both ends of the retail spectrum. Vibrant new retailers are great for Ottawa residents as well as other retailers. Many retailers welcome the competition, especially if it keeps hard-earned Ottawa dollars in the city. Providing more retail opportunities for Ottawans circumvents the need for out-of-town shopping excursions and brings in jobs (Nordstrom alone has created over new 600 jobs) meaning more money coming in and staying in town. The rejuvenation of Rideau Centre is the latest step in an evolution of retail in Ottawa and a welcome investment in the city’s future. Tags: Kate Spade, Luxury Shopping, Nordstrom, Ottawa Retail, Ottawa Shopping, Retail, Rideau Centre, Shopping, Tiffany & Co.